Documents expose the flow of money and influence from corporations that stand to profit from state leaders' efforts to expand and deregulate digital education. This story originally was published on Sept. 2, 2012. Maine’s education commissioner had just returned to his Augusta office last October after a three-day trip to San Francisco where he attended a summit of conservative education reformers convened by former Florida Gov. Jeb Bush’s Foundation for Excellence in Education, which had paid for the trip. He’d heard presentations on the merits of full-time virtual public schools — ones without classrooms, playgrounds or in-person teachers — and watched as Bush unveiled the “first ever” report card praising the states that had given online schools the widest leeway. But what had Bowen especially enthusiastic was his meeting with Bush’s top education aide, Patricia Levesque, who runs the foundation but is paid through her private firm, which lobbies Florida officials on behalf of online education companies. Bowen was preparing an aggressive reform drive on initiatives intended to dramatically expand and deregulate online education in Maine, but he felt overwhelmed. The two companies have at times acted directly, spending tens of thousands of dollars lobbying lawmakers in Augusta and nurturing the creation of the supposedly independent boards for the proposed virtual schools they would operate and largely control. More often they have worked through intermediaries. K12 Inc. donated $19,000 to a political action committee that supported LePage’s candidacy in 2010. K12 and Connections Education provided support to Jeb Bush’s foundation and to a controversial corporate-funded organization for state legislators, the American Legislative Exchange Council, or ALEC. Both K12 and Connections Education built relationships with Maine lawmakers and officials who introduced laws and policies beneficial to the companies’ bottom lines. DIVERSIFYING THE LANDSCAPE, OR MILKING PUBLIC EDUCATION? Defenders of full-time virtual schools say the schools will diversify and enrich Maine’s educational landscape, providing additional options — and substantial new curricular resources — for parents and students who wish to use them. The big online education companies have developed a wide range of courses and products, which they can provide at a lower per-pupil cost than a conventional class. “We took a cautious approach in Maine, and the winner here will be everybody: the company that provides a good product; the state; and most importantly the student,” says Sen. Garrett Mason, R-Livermore Falls, who sponsored the 2011 charter school law that made such schools possible. Critics charge that the online education companies that wish to operate Maine’s virtual schools divert precious public education dollars into profits and dividends while providing education of dubious quality. (See sidebar). In many states, the companies have also advanced their interests through their memberships in the American Legislative Exchange Council. While ALEC claims to be a nonpartisan professional association for state legislators, critics say it is really a corporate-funded conduit allowing businesses to write legislation for compliant lawmakers. Virtually all of its funding comes from its corporate members — which include K12 Inc. and Pearson’s Connections Education — who have collective veto power over the text of its model bills, which cover everything from “right to work” labor laws to “stand your ground” gun laws. They also in effect pay the expenses of many legislative members to attend meetings. ALEC’s membership lists and the model bills they provided to legislators were secret until last year, when they were obtained and published by a watchdog group, the Center for Media and Democracy. Bowen was also an ALEC member in March 2011, the month he was confirmed as commissioner, according to a second set of ALEC documents leaked to Common Cause and posted on their website earlier this summer. 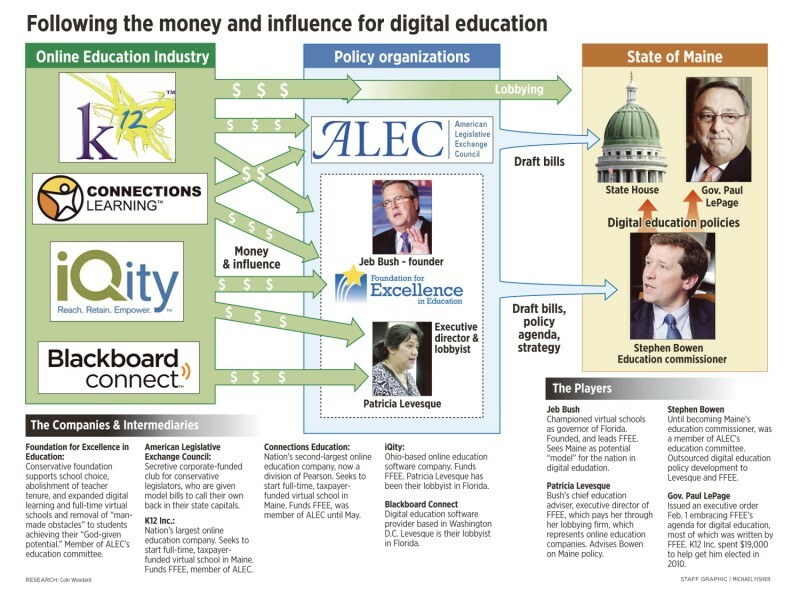 Bowen — then a senior adviser to LePage and the head of education initiatives for the conservative Maine Heritage Policy Center — served as a private sector member of ALEC’s education committee, where he worked alongside officials from K12, Connections and other interested companies evaluating and approving model bills — including one creating centralized state clearinghouses for the sale of online courses. The leaked documents also showed that ALEC-sponsored digital education bills have been introduced in state legislatures across the country in recent years. Here in Maine, several ALEC model bills that would benefit online education companies were introduced by the current Legislature. They included several measures that sought to use public funds to pay private school tuition, a law that allows public schools to act like charter schools, and parts of the charter school bill sponsored by Sen. Mason, who said ALEC was among the many interested parties he consulted while creating it. K12 was especially engaged in lobbying on the charter school bill and other legislation connected with digital learning. K12 has paid $33,074 to Augusta lobbyists since 2009, and contributed $19,000 to LePage’s election effort through the RGA Maine PAC. Connections paid Maine lobbyists $3,950 last year, all of it in connection with the charter bill, which allowed virtual schools but required that they be governed by local nonprofit organizations. Connections Education helped set up a rival bid to create the Maine Connections Academy. Their board consists of Rep. Amy Volk, R-Scarborough, sponsor of several ALEC-drafted education bills this past term; state Republican Party vice chair Ruth Summers, wife of Secretary of State and U.S. Senate candidate Charlie Summers; Pioneer Telephone founder Peter Bouchard; and former state Sen. Carol Weston, whom ALEC named 2008 State Legislator of the Year and who now heads the Maine chapter of Americans for Prosperity, an organization founded by conservative billionaires Charles and David Koch, who are also major donors to ALEC. Earlier this year, both entities applied to the new independent state charter school commission for permission to start full-time virtual schools in Maine. According to its application, K12’s school was to grow to 1,000 students, and expected to receive $6,287 to $6,735 for each one from the state treasury, depending on grade level. Connections’ school would have 3,000 students. On June 7, the charter school commissioners set aside both applications, expressing concern both about the proposed schools’ level of independence from the for-profit online education companies from which they would contract their services, and the all-volunteer commission’s competence to evaluate their proposals in the time available. For instance, in their application, Maine Virtual Academy delegates all day-to-day management and operations to two officials, both of whom are to be recruited and employed by K12, as will all teachers. The school’s board plays little or no role in the hiring of these officials. “K12 itself is in the best position to make final hiring and supervisory decisions relative to the administrators,” the application reads. The charter school commission’s decision to postpone evaluation of the virtual schools’ applications elicited a fiery June 11 letter from LePage, who suggested they reconsider or resign. The commissioners stood by their decision, and both entities recently withdrew their applications, though they say they intend to reapply next year. In the process, however, each provided a glimpse into who actually calls the shots. Maine Connections Academy board member Volk was listed as the primary contact person on the school’s application. She responded to a request for comment only after first consulting with Barrie Drum, Connections Education’s senior director of state relations in Baltimore. “I just spoke with her and she said that they were not withdrawing the application, but had asked to have it taken down off the website,” Volk said, before referring follow-up questions to Drum and providing a cellphone number. Drum answered and appeared flustered to be speaking to a journalist and said she would call back. Asked if she was on the board or authorized to speak for them, she responded in the negative and tersely referred further queries back to the board. In an interview a few days previously, Mills had been surprised to learn that rival Maine Connections Academy had withdrawn its bid, and said it was not something he and his board colleagues had considered for their application and didn’t see why it would be necessary. “If they weren’t performing well, I’d turn on them in a moment and everyone knows I will,” he added. Digital education companies also have something less than an arm’s-length relationship with Bush’s Foundation for Excellence in Education, the organization Commissioner Bowen has leaned on in developing administration policy. The foundation’s Digital Learning Now! initiative receives funding from Pearson, K12, textbook publishing giants Houghton Mifflin-Harcourt and McGraw-Hill, and tech companies such as Apple, Intel and Microsoft, and digital curriculum developers Apex Learning and IQ Innovations iQity. The initiative — whose 10-point strategy has been formally embraced by the LePage administration — focuses on removing legal barriers to public financing of virtual classes. • deprive school districts of “the ability to deny access to approved virtual schools and individual online courses” even as they pay for their students to use them out of their per-pupil budget allocation. Levesque promotes these initiatives as the executive director of Bush’s foundation, but she and her deputy, Deirdre Finn, receive no salary, the organization’s tax returns show. Instead, the foundation pays fees — $156,848 in 2010 — to Meridian Strategies LLC, a consulting firm jointly owned by the two women, with the stipulation that the payment be divided between them. The foundation’s Florida subsidiary paid Meridian an additional $156,848 in “consulting and management” fees. Meridian earns additional fees lobbying in Florida for digital education concerns including iQity, The College Board, software provider Blackboard Connect, and Hayes Computer Systems. It was to these two individuals that Bowen has repeatedly turned for help in developing digital and other education policies for Maine, according to emails obtained through a public records request by In the Public Interest, a Washington, D.C.,-based group that scrutinizes efforts to privatize public services. The group — which made similar requests in other states — forwarded nearly 1,100 pages of department emails to The Portland Press Herald and Maine Sunday Telegram. At Bowen’s request, Levesque and her staff forwarded drafts of legislation on a wide range of reforms, including language requiring that all students take at least one Advanced Placement class online in order to graduate. When Bowen was unable to get the Legislature’s education committee “where we needed them to be” on a bill that would require school districts to pay for any online class any of their students chose to enroll in elsewhere in the state, he asked for further help. Finn responded affirmatively to Bowen’s plea for help, and they scheduled a telephone call. Bowen’s emails to others show he was seeking funding from conservative foundations to “bring in a project manager of some kind to help shepherd the development of the plan.” He also agreed to coordinate with his old employer, the conservative Maine Heritage Policy Center, to further the plan. In February, Bowen was invited to Bush’s “Governor’s Symposium” in April in North Carolina to “share Maine’s approach to the system changes that must occur” in digital learning. “We are excited about the work you and Governor LePage are doing, and the potential for your state to be a model,” a foundation official wrote him. Reached for comment, Bowen distanced himself from the “10 elements,” saying his department looked at them as “a road map to bounce our state policy objectives off of” rather than objectives they had committed to. Bush, the commissioner said, was likely excited about Maine because of former Gov. Angus King’s pioneering laptop program, which has equipped all seventh- and eighth-graders, about half of high school students, and all middle and secondary schoolteachers with Apple computers. “This is one piece that no other state has,” he noted. Bowen rejected the notion that online education companies were having undue influence on the department’s policies, which in any case would be scrutinized through the democratic process, needing to pass legislative committees and floor votes. CLARIFICATION : This story was updated Sept. 5 to clarify that K12 Inc. contributed $19,000 to the Republican Governors Association’s Maine PAC, which made independent expenditures to help Gov. LePage win election.